alli® is marketed as a weight loss aid that contains orlistat, and this ingredient has been the subject in over 100 clinical studies, as stated by the manufacturer. According to the manufacturer this product blocks fat and is FDA-Approved for O-T-C weight loss. alli® is only promoted for use by individuals 18 or older and have a BMI of 25+. It appears that this product states that it does not promote mood swings or increase the heart rate. Use as directed for best results, if any results may occur. Eat 3 well-balanced, reduced-calorie meals and 1 snack a day. Stick to about 15g of fat per meal. Take one alli® with each meal containing about 15 grams of fat. No more than 30% of the calories of each meal you eat should come from fat. No more than three capsules daily. Take a daily multivitamin at bedtime when taking alli®. Drink plenty of water throughout the day. Refer to packaging for detailed information. 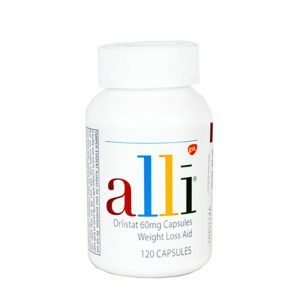 alli® weight loss aid is sold in retail stores and is sold in two sizes. You can purchase either 60 capsules or 120 capsules. Be sure to use as directed and maintain healthy eating habit. alli® claims its FDA Approved and contains an ingredient that has been clinically researched.